Horizontal curves make up a small percentage of total road miles, yet account for one-quarter of all highway fatalities. 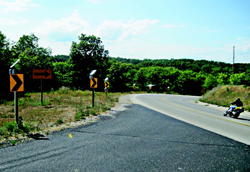 The majority of crashes on curves involve lane departures. 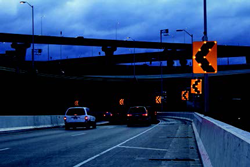 The Sequential Dynamic Curve Warning System consists of a series of solar-powered, LED-enhanced BlinkerSigns (a Curve Warning BlinkerSign and an array of Chevron BlinkerSigns) that are installed throughout a curve. Approaching vehicles, sensed by radar or other ITS device, trigger the controller that wirelessly activates the LED signs to flash sequentially through the curve to warn speeding drivers to slow down. 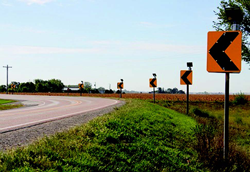 The field study will evaluate the effectiveness of the technology in reducing vehicle speeds and in reducing the frequency and/or the severity of curve-related crashes. Participating State DOTs include Iowa, Missouri, Texas, Washington, and Wisconsin.